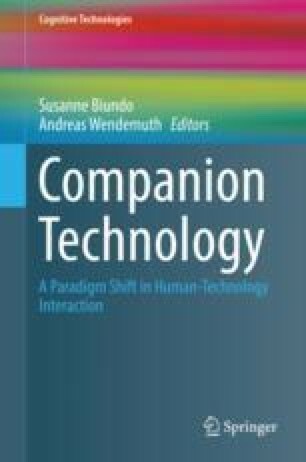 Companion-Technology for cognitive technical systems consists of a multitude of components that implement different properties. A primary point is the architecture which is responsible for the interoperability of all components. It defines the capabilities of the systems crucially. For research concerning the requirements and effects of the architecture, several demonstration scenarios were developed. Each of these demonstration scenarios focuses on some aspects of a Companion-System. For the implementation a middleware concept was used, having the capability to realize the major part of the Companion-Systems. Currently the system architecture takes up only a minor property in projects which are working on related research topics. For the description of an architecture representing the major part of possible Companion-Systems, the demonstration scenarios are studied with regard to their system structure and the constituting components. A monolithic architecture enables a simple system design and fast direct connections between the components, such as: sensors with their processing and fusion components, knowledge bases, planning components, dialog systems and interaction components. Herein, only a limited number of possible Companion-Systems can be represented. In a principled approach, a dynamic architecture, capable of including new components during run time, is able to represent almost all Companion-Systems. Furthermore, an approach for enhancing the architecture is introduced. This work was supported by the Transregional Collaborative Research Centre SFB/TRR 62 “Companion-Technology for Cognitive Technical Systems” which is funded by the German Research Foundation (DFG). The authors thank the following colleagues for their invaluable support (in alphabetical order): Pascal Bercher, Peter Kurzok, Andreas Meinecke, Bernd Schattenberg, and Felix Schüssel.